MAKES LUNCH IRRESISTIBLE - Pantry Elements Silicone Cupcake Liners make eating fun by separating veggies, snacks and fruits in a kid's bento lunchbox. Pack a nutritious meal and avoid the processed food rut. Picky eaters love eating healthy meals using these bright, vibrant, rainbow colors! Check out our assorted size and shape options. PREMIUM QUALITY YOU CAN TRUST - Our sturdy but flexible, eco-friendly, easy-release, non-stick silicon molds are BPA, PVC and phthalate free, and are made from the HIGHEST performance, 100% pure, food-grade silicone meeting stringent U.S. FDA and European LFGB food safety standards to safeguard your family's health! No chemical coatings, no fillers, pinch test passed! Guaranteed. SPECIFICATIONS AND DIMENSIONS - Each Standard Size round individual mold measures 2.7 in. dia. (top) x 1.25 in. tall, and 1.8 in. dia. (bottom). Each 12 pack comes in six fun, vibrant colors (pink, orange, yellow, green, blue and purple - two cups in each color), packaged in a durable, clear storage jar with a screw top lid. Temperature safe from -40 F to 500 F. Microwave, oven, refrigerator, freezer and dishwasher safe. They feature our OptiBake technology to ensure optimum baking performance. MULTIPURPOSE VERSATILITY - Great for cooking eggs, baking muffins, cupcakes, and breads, preparing frozen treats, desserts on a baking sheet, candy making. Perfect holder for sorting small items. Fun for a birthday or holiday party, baby shower, or wedding! Use to prepare recipes for breakfast, lunch, dinner, snack or mealtime spread. 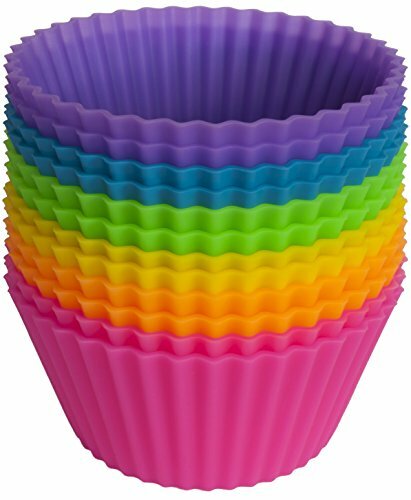 Replace your paper cake cups, muffin pan or tin, with our environmentally safe alternative. Imagine this space saver in your kitchen baking supplies pantry! SATISFACTION GUARANTEE - Pantry Elements offers this exclusive manufacturer's warranty for 1 year. If you are not satisfied with this product, return it for replacement or refund. This warranty is exclusive to sales only through Pantry Elements. Purchases made through unauthorized resellers do not qualify for the manufacturer's warranty. Perfect to add into stainless steel bento boxes, can flex easily to fit. Great for little crackers or small cut fruit.